"Carole and Cynthia, we were so very sorry to hear about Richie - such a kind, ou"
"Richie was my buddy. Loved riding bikes and playing catch. Also, I mostly enjoye"
"Our heartfelt condolences to you and the family. I am so sorry ." "My thoughts and prayers are with you during this difficult time. 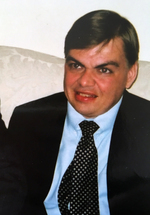 Richie had suc"
Richard Earl Driggers, "Richie, " a resident of North Bethesda, MD for over 50 years, died on Sunday, April 1, 2018, at John Hopkins Suburban Hospital in Bethesda, MD. He was 54. Born January 19, 1964, at Providence Hospital in Washington, D.C. to Carole A. Driggers and the late Earl Driggers. He graduated from Stephen Knolls Special Education School and Walter Johnson High School in Bethesda, MD. Richard was in the 1st special needs scout troop in Montgomery County. He was a member of Holy Cross Catholic Church in Garrett Park, MD, a 1st class rank in Special Needs Troop 1342 of the Boy Scouts of America, and a longtime participant with the Special Olympics in Montgomery County. Richie was a collector of hundreds of Matchbox cars and other unique toy cars and trucks. When he was younger, he enjoyed boating with his family on the South River aboard the "Sea Spirit." Richie also enjoyed car shows, Harley Davidson showrooms, and visiting the Fire Department. He is preceded in death by his father; three grandparents, Oneida J. Driggers, Florence (Hartman) Hibbits and James David Bales. In addition to his mother, he is survived by his sister, Cynthia Marie (Driggers) Duncan of Edgewater, MD; a nephew, Camden John Duncan; a niece, Emily Anne Duncan; an uncle, James H. Bales; a grandfather, Hezekiah Driggers; and several cousins. Friends are invited to celebrate Richard's life at the George P. Kalas Funeral Home, 2973 Solomons Island Road, Edgewater, MD on Monday, April 9 from 6 to 8 pm. Mass of Christian Burial will be held at Holy Family Catholic Church, 836 W. Central Ave., Davidsonville, MD on Tuesday, April 10 at 10:30 am. Entombment at Resurrection Cemetery, Clinton, MD. Memorial donations may be made in Richard's name to Boy Scouts of America National Capital Area; Special Needs Scouting Program, 9190 Rockville Pike, Bethesda, MD 20814 or Arundel Volunteer Fire Dept., Davidsonville/Gambrills, 2380 Davidsonville Road, Gambrills, MD 21054. Please take a moment and leave a condolence for Richie’s family by using the link to the left. For your convenience you can order flowers by using the link below.